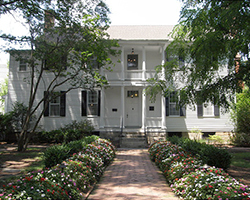 The NSCDA-NC owns four historic properties. The Burgwin-Wright House is one of only four colonial structures remaining in Wilmington. Built in 1770-1771 on the ballast stone foundation of the former city jail by merchant and planter John Burgwin, it is one of the finest examples of Georgian architecture in the state. The NC Dames purchased the property in 1937 with the express intention of making it their headquarters house. Restoring the property became a labor of love that continued through the remainder of the 20th century. In 1951, the house opened its doors to the public as a museum. For decades, the museum has offered a free educational program attended by every fourth grade class in the local school district. The Burgwin-Wright House is surrounded by 18th century-style gardens designed by Colonial Williamsburg landscape architects Alden Hopkins and Donald Parker. The gardens are available for weddings and other private events. The Fourth House was the fourth structure built in the Moravian village of Salem, North Carolina. 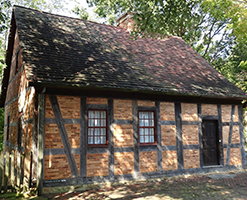 Completed in 1768, it is the oldest original structure in the Old Salem Historic Landmark District and one of the only remaining half-timber homes in the U.S. Recognizing its historical significance and dire need of repair, the Forsyth Committee of the NSCDA-NC purchased the Fourth House in 1936 and immediately gifted the property to the State Society. In 1966, the NC Dames and Old Salem, Inc. entered into a partnership that continues today. 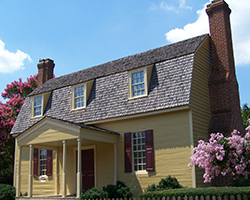 Under the conditions of a long-term lease, the NSCDA-NC retains ownership of the house, but Old Salem, Inc. provides ongoing maintenance. The interior of the Fourth House is not open to the public, but its presence contributes significantly to the interpretation of the historic village. Completed in 1799, Haywood Hall was constructed by John Haywood, North Carolina’s first treasurer and Raleigh's first mayor. A rare survivor of Raleigh's federal period, it also has the distinction of being the oldest house within the city limits that remains on its original foundation. Members of the Haywood family occupied the residence until the death of Mary Haywood Stearns in 1977. Mrs. Stearns bequeathed the property, along with its furnishings, to the NSCDA-NC "to be maintained as a place of historic interest for the public." The site operates as a museum, interpreting family life from the earliest days of Raleigh through the 1970s. Haywood Hall also has become a popular venue for weddings and other private events, a use which has historic roots. John Haywood entertained so frequently at Haywood Hall, that it became an unofficial meeting place for legislators and dignitaries when visiting the capital. Currently, funds are being raised to restore John Haywood's ballroom. Haywood Hall is managed and maintained by the non-profit, Haywood Hall, Inc., which leases the property from the NC Society. Haywood Hall receives annual financial support from the NC Society's Museum Houses Endowment Fund and from contributions by individual Dames. Built in 1769 by Joel Lane, the house and its owner both played key roles in North Carolina's early history. A planter who owned thousands of acres, Lane also was a member of the colonial general assembly, a Revolutionary War patriot and a delegate to the 1789 convention in Halifax that ratified the United States Constitution. Lane was directly involved in the decision to locate the permanent capital of the state in Wake County through the sale of 1,000 acres of his land upon which the city of Raleigh was established. After Lane’s death in 1795, the house had several owners until 1927 when the Wake County Committee of the NSCDA-NC purchased it to ensure its preservation. The Wake County Dames deeded the house to the NSCDA-NC in 1972. Today, the Joel Lane House is operated as a museum by the non-profit Joel Lane House, Inc., which leases the property from the NC Society. The Society provides financial support to the museum house through contributions from individual members and the Museum Houses Endowment. 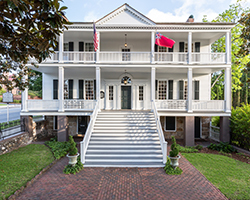 There are more than 84 historic properties across the country that are owned outright or affiliated with the National Society of the Colonial Dames of America and its corporate Societies. To learn more, visit the NSCDA web site.